How to make sure your drinking water is safe and how to Disinfect Drinking Water when there arise crisis situations like an epidemic of Cholera, Typhoid or such other water borne diseases in the area around you. In such cases it is better that your drinking water is boiled even though it is coming out of a water purifier. Also the whole house water should be disinfected by disinfecting the main storage tanks. The best way to disinfect water in such emergencies is with bleach or Hypochlorite solution either Sodium Hypochlorite like Clorox or granular Calcium Hypochlorite easily available in the market. During such epidemics of water borne diseases near your house, then the whole house water supply should be disinfected by adding bleach like Clorox to the main tank and letting water run out of all the taps till the main tank is empty. This is the method to sterilise the whole house water supply system. We will discuss each of the different ways to purify water and methods of disinfecting water in emergencies. Is boiled water best drinking water? Is boiling water the best method to make drinking water safe? Most people think that to purify water by boiling is the best method of water purification. Boiling to kill germs in water is the best method of getting rid of germs in water, but boiling water does not remove dissolved poison chemicals in water like Arsenic, Chromium-6, Nitrates, Radon, etc. Boiling water to kill germs is the sure way to sterilize water, especially when there are outbreaks of dysentery, cholera and other similar epidemics in areas near to you. Chemicals present in ground water of many regions of the world like Arsenic, Chromium-6, Nitrates, Radon, etc. are poisonous and most dangerous to your health and the most difficult to get rid of. These dissolved chemicals are not removed by boiling; in fact they get more concentrated on boiling and are a severe health hazard. So always remember that dissolved chemicals in drinking water cannot be removed by boiling and is most dangerous. Municipality supplied tap water will be safe to drink after boiling, since the authorities will make sure that there are no heavy metals like Arsenic, Chromium-6 and Lead in the water. With well water you have to be careful. For example, if there is Arsenic in the ground water in the area, then the well water will certainly be contaminated by it. Boiling this water will actually increase the concentration of Arsenic in the water, since some water is being evaporated. So all well waters should be tested once in 6 months, to make sure that there are no water contaminants harmful to health. If you suspect that your drinking water has the slightest chance of having dissolved poison chemicals, then the very best solution will be to get an RO water purifier or an NF water purifier. Sometimes there arise crisis situations like an epidemic of Cholera, Typhoid or such other water borne diseases in the area around you. In such cases it is better that you disinfect or sterilize your whole house water supply. How to disnfect water with bleach is quite straightforward and easy. You just pour bleach, a clarified solution of bleaching powder in water or Sodium Hypochlorite Solution, which is also available as the branded 'Clorox', directly into your main water tank. As to how much bleach is required to disinfect and purify water or how much Clorox to purify water, the answer is about one litre of bleach containing at least 5% available Chlorine or Clorox (5% available chlorine) for every 1000 liter water tank will be more than enough for such crisis situations. For drinking purpose this water can pass through your regular kitchen water purifier with activated carbon to remove the high chlorine taste of the water. Special Water Purification Tablets like Katadyn Micropur which are based on Silver ions are available. Chlorine tablets for water purification are the most popular water disinfecting tablets and the next most popular tablets are iodine water purification tablets. A new type of Chlorine Dioxide water purification tablets are also becoming popular. Some of the leading brands are aquatabs water purification tablets and potable aqua water purification tablets in the USA and 'Shudhu' water purification tablets in India. Apart from the Chlorine and iodine water purification tablets, also available are the nano silver ion water purification tablets like the Katadyn Micropur water purification tablets. The popular Indian 'Shudhu' water purification tablets is distributed almost free all over India. 'Shudhu' water purification tablets are based on Sodium Dichloroisocyanurate or SDIC or NaDCC, which dissolves to release hypochlorous acid with free available chlorine to disinfect water and is effective against jaundice or hepatitis, diarrhoea, dysentery, cholera, polio, giardia, infantile diaorea caused by Rota Virus, all gram positive and negative bacteria, virus, and fungi. A unique water purifier based on Nano silver particles have been developed by the Institute of Technology, IIT Madras has recently grabbed world headlines. What is unique about this IIT Nano water purifier is that it can also remove heavy metals from water in addition to the usual biological sterilization of the water. The image above shows the cutaway diagram of the device on the left and an actual photo on the right. The IIT nano water purifier has a two stage filtration process and can purify 10 liters of water in one hour and it does not need electricity to work. The first stage of water purification involves the use of the silver nano particles embedded in porous baked clay to kill viruses, bacteria and other dangerous microbes or micro-biota. The second stage adsorbs the heavy metals like Arsenic, which is a danger in the ground waters and wells of some areas in India. the filter elements would require recharging or change after purifying about 3600 liters of water. 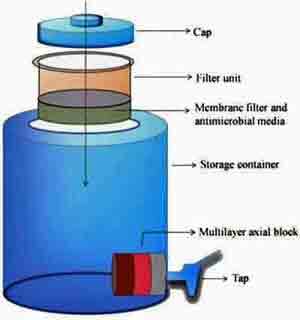 This water purifier can be manufactured at a very low cost, and variants of this unique water purifier will hopefully be available shortly. We have an image here of the unique Steripen portable UV water purifier model 'ULTRA' which is an ideal for use as an emergency water purifier. 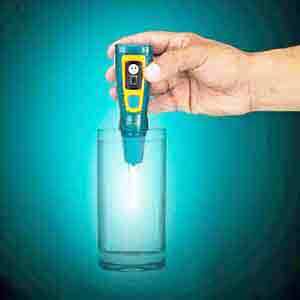 This UV water purifier is portable and works off a rechargeable battery. Here you see the UV water purifier in action disinfecting a glass of water. You need to keep the UV light lit inside the glass for a minimum of 45 seconds to be sure that the water in the glass has been disinfected. So it is a very convenient water purifier to be carried along with you in your travels, to purify your drinking water just before you drink it. You will be the centre of attraction in a restaurant when you are using it, but you may not be very popular with the restaurant owner. Steripen guarantees that in just 45 seconds, your water is safe to drink. To quote from their site "SteriPEN is proven to be safe and effective, eliminating over 99.9% of bacteria, viruses and protozoa that cause water-borne illness. SteriPEN has earned the Water Quality Association’s Gold Seal, certifying its effectiveness. Ultra, from SteriPEN, is the most advanced UV water purifier in the world. Rechargeable and easy to use – the smiley face tells you when the water is safe to drink – it’s a great gift for the Dad who loves the outdoors." 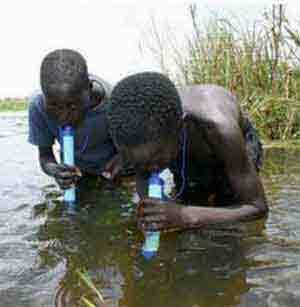 Shown here is the 'LifeStraw' Miracle Straw which is a UF water purifier very useful in emergencies. The 'LifeStraw' Miracle Straw won the Time Magazine “Invention of the Year” award recently. LifeStraw is a water purifier which works exactly like a straw you use when drinking Pepsi. In the picture on the right you see children drinking dirty river water using LifeStraw. This point of use water purifier straw has hollow fibre membranes with 0.2 micron pore size which makes it an ultrafiltration or UF purifier, with larger than the usual UF water purifier pores. LifeStraw removes a minimum of 99.9% of all waterborne parasites and germs, including cysts of protozoan giardia and cryptosporidium. Being only of 0.2 micron pore size some small viruses may get through. This will not be the case with a point of use regular UF water purifier meant for the kitchen, where the pores are of .01 micron size and will not allow even the smallest of virus to get through to the purified water. Life straw can purify upto a 1000 liters of water which is enough to last one person for a year. LifeStraw was designed by Vestergaard Frandsen of Switzerland. LifeStraw is available for retail sale in some parts of the world, but the majority of it is distributed free of charge at times of disasters all around the world by organisations like the Red Cross. Some of the awards won by Life Straw are the 2008 Saatchi & Saatchi Award for World Changing Ideas, the ‘INDEX: 2005’ International Design Award and "Best Invention of 2005" by Time Magazine.